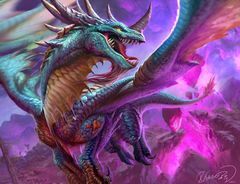 阿瑞苟斯（Arygos） was an ancient blue dragon and offspring of Malygos. During the War of the Shifting Sands, he was taken captive by the Qiraji. After the short-lived races freed him from his 9,000-year imprisonment Arygos openly sided with his father Malygos during the Nexus War. Following the death of his father Arygos wanted to ensure that he was chosen to be the leader of the blue dragonflight and allied himself with Deathwing, but was later betrayed and killed by the Twilight Father. Arygos, along with Caelestrasz and Merithra, pushed the Qiraji back into Ahn'Qiraj to allow Anachronos, Fandral Staghelm, and the night elves to create a magical barrier to hold in the Qiraji. The three dragons and their companions flew headlong into the Qiraji legions, into the city where they hoped their sacrifice would not be in vain. Though the magical barrier was created, the three dragons were lost within the walls, where they still remained for the next 9,000 years, in humanoid form, as prisoners of the Old God C'Thun. In truth, Arygos wished to ensure his own succession as leader of the blue dragonflight, and had allied with Deathwing and the twilight dragonflight to assure this. When Thrall later arrived at the Nexus, Arygos told his guards to simply kill him and the bronze dragon that brought him there, but Kalecgos intervened on Thrall's behalf. 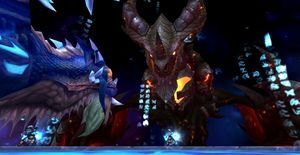 Arygos left the Nexus, secretly meeting with the Twilight Father at Wyrmrest Temple to discuss plans that would ensure his own position as the next Blue Aspect. However, the Twilight Father was angry that Arygos had not yet killed Thrall, whose death was vital to his plans. Deathwing说： Calm yourself, Arygos. Your barrier will buy you all the time you need. With Kalecgos dead, your destiny as the blue aspect shall be realized. Arygos说： And once this new order is established, my place will be secure, yes? Deathwing说： Your reign over the realm of magic will be absolute, even after the Hour of Twilight. But be warned Arygos, son of Malygos- Don't make the mistakes of your father. Cross me, and your punishment will be greater than the madness he suffered. We gather to determine the fate of our troubled flight. Our history has been wrought with great challenges. Our future promises even greater threats. These circumstances demand a powerful leader. I was raised at the feet of my father. I watched as he steered us through adversity, never flinching from difficult decisions. Some called my father mad. But even in his darkest hours, his vision was clear. He put the needs of this flight first and foremost. He sought to consolidate our rightful power, fortifying us for the cataclysm that he saw coming! Brothers, we must take what is ours! Under my leadership, this flight WILL rise again, beyond the glory of our past, onwards to an even greater destiny! I will see to it! Arygos is voiced by Jim Pirri during Dragonwrath, Tarecgosa's Rest questline. 补丁 4.2.0 (2011-06-28): Now also appears during the Dragonwrath, Tarecgosa's Rest quest chain.